He blamed especially neo-Pentecostalism, or charismatics, for his defeat. “Brazil, structurally, is a hybrid between castes and meritocracy. It is admitted that the individual may go up, but alone, as long as the distance between classes remains. Neo-Pentecostalism and the Prosperity Gospel are compatible with that,” Haddad said. 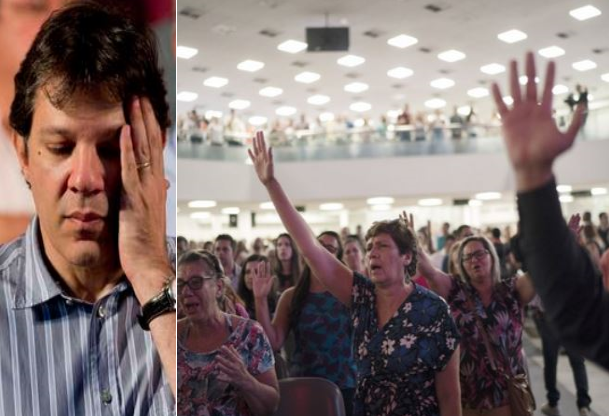 While historic Protestant churches overwhelmingly affected by the Theology of Integral Mission (the Protestant version of Liberation Theology, very similar to the Social Gospel) blame the Prosperity Gospel for all the problems in the Evangelical Church in Brazil, Haddad has directly blamed neo-Pentecostalism and the Prosperity Gospel for his defeat! He hit the spot. When the initiative of the ruling Workers’ Party for imposing homosexual indoctrination on schoolchildren began to move forward in 2011 during Haddad’s term as minister of education, the largest opposition came not from Catholic bishops nor from historic Protestant churches like the Brazilian Presbyterian Church. It came from neo-Pentecostal leaders, who eventually pressured the Evangelical Parliamentary Caucus in the Brazilian Congress, which in turn pressured leftist President Dilma Rousseff to veto it. Haddad is not the first leftist leader to identify neo-Pentecostalism as an obstacle to leftism. 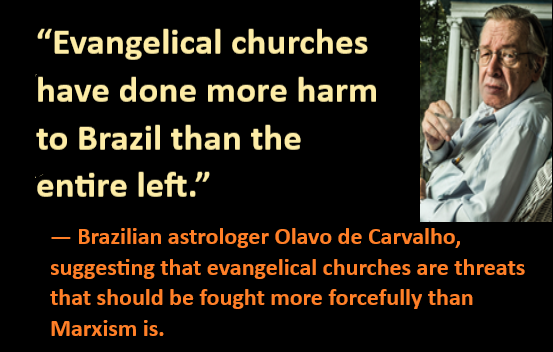 In 2016 Brazilian Marxist philosopher Marilena Chaui said that the main threat to Brazilian leftism is the Prosperity Gospel from neo-Pentecostal churches. This theological modality, which was born in the United States and is spreading as a wildfire in Brazil, has great affinity with American capitalism and aversion to the socialist system. The growth of neo-Pentecostalism creates natural friction with socialism. The more neo-Pentecostalism, the less socialism. Venezuela, which is being ravaged by socialism, is an example. There are very few neo-Pentecostal churches in Venezuela, whose population is 96 percent Catholic. Although Haddad attributed his defeat to neo-Pentecostalism and although the U.S. and Israeli media reported that Brazilian President-elect Jair Bolsonaro’s greatest conservative force were evangelicals, Bolsonaro has so far given priority to cabinet appointments to suggestions coming from Olavo de Carvalho, whose adherents believe that without he Bolsonaro would not be president. Although the name of Rev. Silas Malafaia appeared several times in the big U.S. media as a prominent influence that led evangelicals to vote for Bolsonaro, the new president, when receiving the name of Guilherme Schelb coming from Malafaia for minister of Education, preferred to welcome the indication of anti-Trump Ricardo Vélez, coming from Carvalho, although the name of Carvalho was not mentioned once in the big U.S. media as having had any influence in the election of Bolsonaro. Bolsonaro also appointed as Foreign Minister Ernesto Araújo, the name indicated by Carvalho. Araújo has an article in a diplomatic magazine by Itamaraty, the Brazilian Foreign Ministry, extolling the Islamic occultist René Guénon, who for many years has been propagandized by Carvalho in Brazil. While Haddad has expressed explicit acknowledgment that his defeat was due to evangelicals, specifically to neo-Pentecostals, from Bolsonaro has not yet come any acknowledgement that his victory was due to them. On the day of his victory, Bolsonaro thanked Brazilians in general and Olavo de Carvalho in particular. Therefore, both Haddad and Carvalho see evangelical churches as major obstacles, threats and evils. But who has been an influence, with his advices, in Bolsonaro’s politics is not Haddad. It is Carvalho himself, who became a Rasputin in his life.